My favourite time of the day is your morning feed on the couch. You are so relaxed and content. The morning light pours in through the windows and between sipping coffee and flicking through interior mags, I get to stare at your indescribable cuteness and marvel at the fact that you are ours. ...and I hate to be the first to subject you to such cheese - but that cushion really suits you. It brings out your eyes. 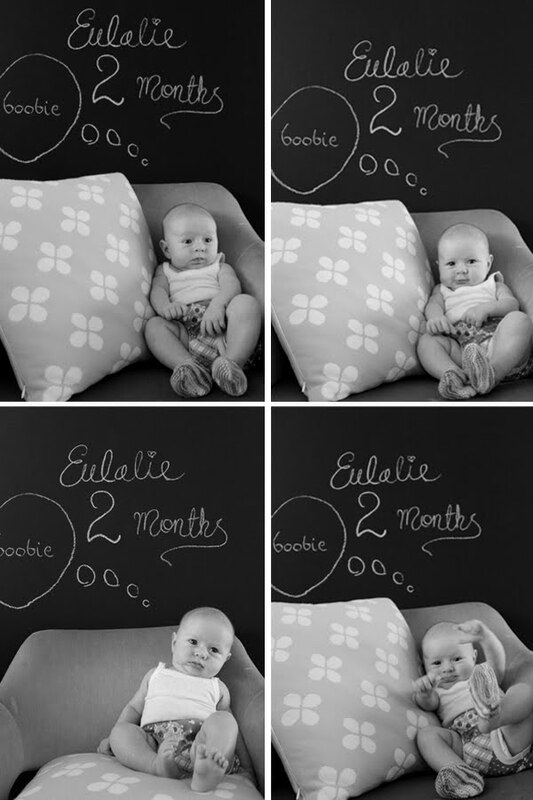 I was a little late getting around to this - Eulalie was 2 months old on Friday. I can't believe two months has passed already, but at the same time... it's hard to remember life without her. She has certainly made quite an impression on us in just this short time! My Grandad made this cot for me when I was born. My sister and I both slept in here when we were babies, and now my own daughter will too. It's such a shame I don't have a photo of myself in here... it is very special to know we all slept in a cot especially handmade for me. It's such a gorgeous cot, made from solid Jarrah. I love the details and it makes Eulalies room even more eclectic and whimsical which I love! ... I think these cute wall decals from mae really set it off! I figure it would be poor form of a girl whose husbands name is Paddy (Patrick) to not do a Paddy's day post... so please excuse the crappy photographs as they were taken this afternoon (last minute) in poor lighting whilst a baby squarked at me from her bassinet. It's quite surprising how much green one has in ones house when one goes searching for it! A weekend project that's taken 12 months. But it's just the right time - I needed a change. I do love old mirrors, but I have to say - my favourite thing has got to be that dried palm branch the I rescued from the driveway. it has been driven over and flattened into the cutest, most perfect miniature tree. FYI - It is really, really difficult to photograph a mirror wall without reflecting all sorts of limbs, camera lenses and other undesirable messy areas of the house. You need to be quite the contortionist. I found myself in the strangest of positions... the things we do. bounce. bounce. smile. bounce. smile. smile. bounce. bounce. whinge. bounce. bounce. whinge. bounce. whinge. whinge. bounce. SQUARK. Nothing fits us. It's depressing. Eulalie is clearly not happy about it. And neither am I. Poor lalie-bug is lost somewhere in between zero's and I'm floating sinking somewhere between post pregnancy, maternity and pre-pregnancy. Although we're both in this fashion-wardrobe-limbo-land together, only one thing is for certain. At least Eulalie can take comfort in the fact that she will, at some stage in the foreseeable future, get to wear all of these gorgeous garments and receive compliments aplenty on her chubby thighs and multiple chins. I, on the other hand, will take comfort in Cadbury's Crunchie ice cream (the family tub, thank you) and just hope some of the chubby compliments are directed at me. My mother always said that breastfeeding your baby is the most beautiful and profound experience. I always listened and believed it was true - but now I know. Please excuse the photographs. One taken very bleary eyed one morning on my iphone. The other one was taken in 1983. ...and this was taken yesterday. I won't even show you the rest of the house. Nesty to festy in six weeks flat. Eulalie (or Laylie Bug... or just 'Bug" as she is now affectionately referred to as) attended her first party yesterday. Her big cousin Keeley turned terrible Terrific Two. Fairies and bubbles and balloons, oh my! So far, my cutie pie daughter has received three party invitations. At the grand old age of six weeks, I believe we may have a socialite in the making. Happy Birthday, Keeley! Lots of kisses and cuddles from Aunty Abell, Uncle Paddy and Laylie Bug xoxoxox. P.S Huge thank you to my little sis, Stephie for Eulalies adorable dress. One of many lovely gifts from her trip to Bali!